The kitchen is made of... Bowls! You are here: Home / TIPS & TRICKS / The kitchen is made of… Bowls! Bowls are super important items in the kitchen. They come in all kinds and sizes. They include mixing bowls, serving bowls, disposable bowls and even cereal bowls. Despite the collection of names, there is a certainly: You will need them sooner or later. It’s crucial to know what sort of bowl is expected for each recipe, considering that it absolutely helps to organize things when preparing food. 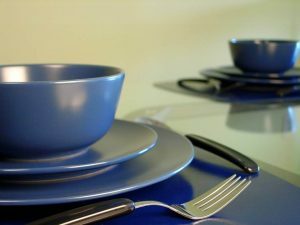 In the course of time and according to your cooking habits, you will quickly have on mind what is your favorite bowl set. For example, suppose that you are baking some brownies. These are made with melted chocolate, eggs, butter, flour, vanilla, a pinch of salt and some nuts. You could prepare them in a stand mixer or just working with a whisk. In both cases you would need bowls. The chocolate can be melted in a water bath (that requires a bowl) or in microwave (inside of a microwave safe bowl). Even with a stand mixer, ingredients must be measured, separated and eggs broken. Where are all these things going to be saved? Cups, plates, glasses, yeah, they work too… However, bowls are so more practical and easy to clean, thanks to their shape and material. There are hundreds of varieties for sale. You probably won’t need to buy all them, unless you have found a special secret recipe that asks for that. You probably need more of the smaller types than larger ones. Always have at least one of each size, invest in a durable set. One of each proportion (small, medium, large) is OK for beginners. Simple recipes will work with that. Although creative minds would be able to change anything into a bowl, including the chopping board and dessert plates, occasionally it does not work, mainly by virtue of the shape. Despite of being creative, advanced cooks will desire a larger bowl set. 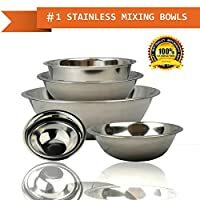 X-Chef Stainless Steel Mixing Bowl (Set of 5)- All in one! 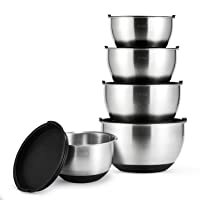 This bowl set includes five different sizes, made in Stainless Steel. But the best part is that they all come with lids, what enables them to preserve prepared food! It saves plastic wrap and space. It’s not over yet! These bowls have an indicative of measurements on their interior, so, be aware, because your measuring cups may get jealous with them. They are not so expensive, considering the durability of the material. Lauryn Janae Premium Mini 3.5″ inch Stackable Custard Pinch Prep Bowls (Set of 15)- So cute! These glass bowls are perfect to organize everything before cooking. This set comes with 15 units, a good number, but with a small size. In this way, large amounts of ingredients will not fit. Great for spices and small portions! FineDine mb-3854 Curved Lip and Flat Base Stainless Steel Mixing (6 Pieces)- Excellent price! This set will solve the problem momentarily. It is not the most durable option, but with six pieces you can work with a lot of recipes. For about 20 dollars you will be able to organize yourself better in the kitchen. Start with these and invest more with time. Dowan Ceramics Soup/cereal Bowl, 6-inch Winter Frost White (Set of 6)-Simple and useful! Dishwasher and Microwave safe! Good for heating small amounts of ingredients in microwave. You could use them to help with the organization and for serving food. These bowl sets are only examples of the many available options on the market. There is no secret when choosing the best option, it must attend your expectations and needs. Don’t forget to analyze the space you have to store kitchenware! Think about how many dishes you cook per week. Do you usually store food? Is microwave an appliance that is repeated on the recipes that you prepare? These are important questions you must ask yourself. Still curious about that brownie recipe? Cook it to make the premiere of your new bowl set! Don’t forget to share the amusement!